Onkyo outs its third Spotify-enabled home cinema receiver | What Hi-Fi? First came the £500 TX-NR609, soon followed by the £800 TX-NR709, and now the £1000 TX-NR809 has landed on these shores – the third of Onkyo's Spotify-enabled home cinema receivers. The 7.2-channel powerhouse delivers a claimed 180W per channel, is THX Select2 Plus-certified and equipped with ISF video calibration. Naturally it will decode all forms of high-definition surround sound, and it's also kitted out with Dolby Pro-Logic IIz and Audyssey DSX. You'll also get eight HDMI inputs, two HDMI outputs (for connecting to different displays), 3D video support and an Audio Return Channel. Should you want to expand your home cinema system further, there are 7.2 channel preamp outputs and the ability to power Zone 2 speakers. A standard ethernet connection allows for hooking up to Spotify, Last.fm and Napster subscription music services, free internet radio via vTuner and audio streaming from a PC or media server. There's support for MP3, WMA, WMA Lossless, FLAC, WAV, Ogg Vorbis, AAC and LPCM audio formats, Windows 7 and DLNA 1.5 networking. On-board video processing is handled by HQV Vida VHD1900 and Qdeo technology by Marvell, giving video upscaling to 1080p. A front-mounted USB socket enables a direct digital connection of a USB flash drive or iPod/iPhone. There's also an additional USB port on the back which can accommodate Onkyo's optional UWF-1 wireless adapter. 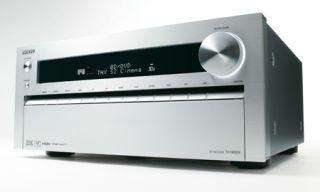 The Onkyo TX-NR809 will be available in the UK in late May.